its possible to export a texture out of the unreal engine? I lost my source texture file. In Content Browser right mouse button click on needed texture. In menu Asset Action -> Export. Hello svv3dUDN, I have tried this in both 4.7.3 and 4.7.4 and that doesnt work. I thought I made a bugreport about it for 4.7.3 but cant find it. I imported texture 4096x4096. Delete source file. Save and reload project. 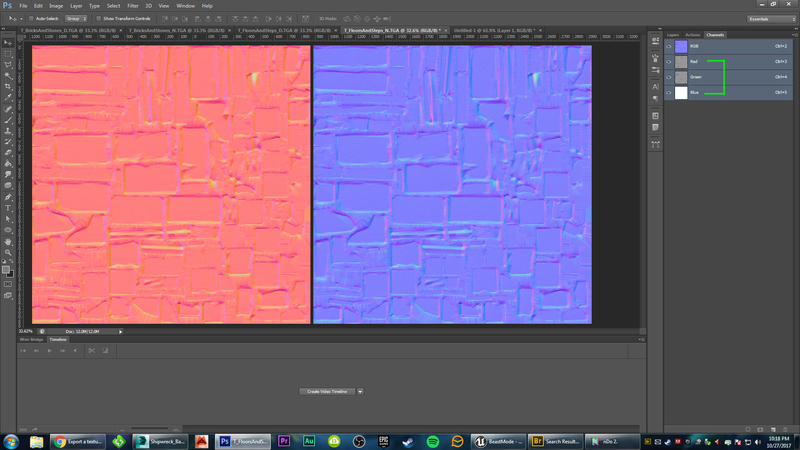 Export texture. No problem. Texture exported normally. UE 4.7.4. I found the issue, it wasnt the filesize but the filetype. 16-bit .PNG doesnt export from ue4. Not only that, but on import the texture is washed out. https://www.youtube.com/watch?v=rYyl5lSsPsw < showcase of issue. Edit: updated the bugreport post. Hey guys, So I discovered a work around of sorts for this issue. When you export the texture, it gives you the warning but it still outputs a TGA file for you. If you open the file in Photoshop (or whatever image editor) you'll see that it looks wrong. What's happening (at least in my case) is that it has inverted the color channels. So Green is fine but Red and Blue were flipped. You can fix this easily enough by copy and pasting the channels to their correct spot in a new document. So the Red channel is actually the Blue and the Blue channel is actually the Red. Here's a screenshot of my normal map that was exported. The left is how it looked when I opened it up after getting the warning message and the right is after I swapped the Red and Blue channels. it works with Asset Action -> Export, thx. How do I convert a "flat" image into a "spherical" image?